Parts of eastern North America, northern South America, southern Europe, the Middle East and several other parts of the world will be able to experience a unique type of solar eclipse this Sunday, November 3. The event is known as a hybrid solar eclipse, and according to Deborah Byrd and Bruce McClure of EarthSky, this type of event “appears fleetingly as an annular or ring eclipse at its start and becomes a brief total eclipse later on.” However, many parts of the world will see a partial eclipse sometime between sunrise and sunset. Byrd and McClure report that the eclipse will be visible to those living in far-eastern North America, the Caribbean, northern South America, southern Greenland, the Atlantic Ocean, southern Europe, Africa, Madagascar and the Middle East. Proper protection will be necessary when observing the event to avoid potential injury or blindness. Provided skies are clear enough, a partial solar eclipse will be visible in eastern North America beginning at sunrise on Sunday. From that location, as well as the Caribbean and the northwestern tip of South America, the eclipse will appear as an extremely shallow and shrinking partial solar eclipse, the EarthSky writers said. “Seen from further west in the US and Canada, the sun will rise with the eclipse nearly over. Assuming you have a flat horizon and good sky conditions, the western limit of the event’s visibility runs through southern Ontario, Ohio, Kentucky, Tennessee, Alabama, and the Florida Panhandle,” they added. Those living west of those areas will not be able to catch a glimpse of the event, Byrd and McClure said. 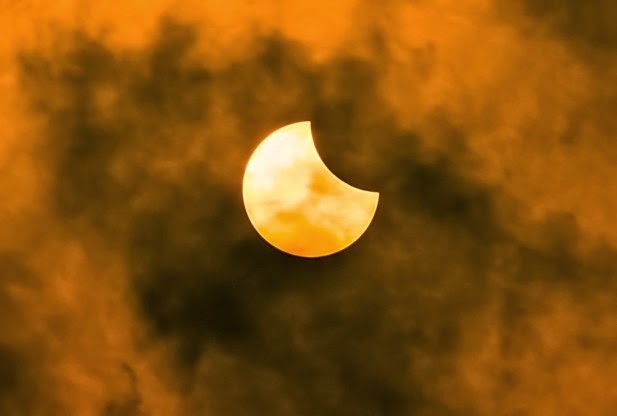 The partial eclipse will be visible until 7:12am EST Sunday morning in Montreal; 7:11am EST in New York; 7:08am EST in Raleigh, North Carolina; 7:02am EST in Miami; 7:00am EST in Havana, Cuba; 6:52am local time in Cartagena, Columbia. It will be visible during the afternoon hours in Europe, Africa and the Middle East. This will be the fifth eclipse and the second solar eclipse of 2013, according to Sean Breslin of The Weather Channel. So how rare of an event is this? Out of the approximately 12,000 solar eclipses that have been recorded since 1999 BC, less than five percent have been hybrid eclipses, he added.